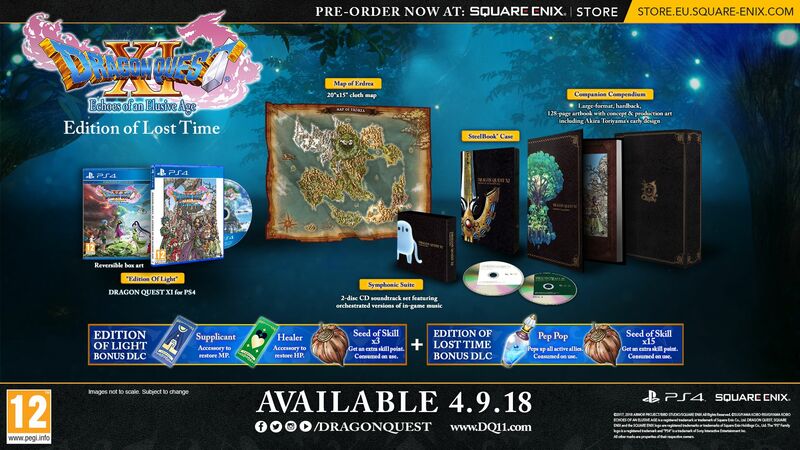 During its E3 Showcase, Square Enix released a new trailer for Dragon Quest XI: Echoes of an Elusive Age, and also revealed two special editions for the game. First is the Edition of Light, which is available physically for PlayStation 4 and digitally for PlayStation 4 and PC. The Edition of Light is priced at $59.99/£49.99 ($59.99/£39.99 on PC) and includes some DLC items — an MP-retoring accessory, a HP-restoring accessory, and three single-use seeds that grant skill points — as well as reversible cover art on the physical edition. Dragon Quest XI: Echoes of an Elusive Age will be released for PlayStation 4 and PC (via Steam) in North America and Europe on September 4, 2018. The game’s Nintendo 3DS version is not being localised, with a planned Nintendo Switch version not yet having a release date in Japan. The western version of Dragon Quest XI will feature some additions not in the original Japanese release, including English voice acting; Draconian Quest mode, a hard mode offering extra challenges; overhauled menus and UI elements; camera mode; and a new dash function as well as improved camera movement.